Are you a harsh task master? My to-do list is out of control. No, that’s not accurate. My list of things I want done has gotten long enough to intimidate me into not picking anyone to get started on because the others start screaming at me for attention. The sheer volume can be deafening. But here’s the really scary part. Each and every one of them I added myself. Sure there are things God has given me to do but I don’t actually put those on the list. Somehow they feel too Holy to type into my reminder program or add to the paper list I make of the things I put on my digital lists. I like the things on His list. They seem like they have a richer feel, a deeper purpose, a sense of Him. They feel more like an invitation into something that matters instead of a striving to make a difference. ←Who Taught You To Decide? Jesus is definitely easier on my day. I literally go crazy when I try to take over my day. I can’t finish things; I feel like I’ve done a lot for nothing. 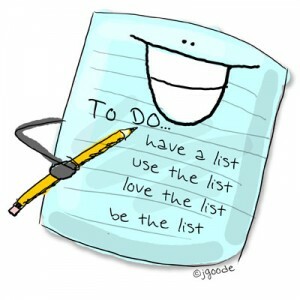 I feel more relaxed, I have more time to rest, when Jesus is holding my To-do list.